Bought it from Ghalib corner of the inner circle Connaught Place. Printed price is Rs.695 (which I think is a bit too steep) but the mian let me buy it for 500. The first thing that I noticed about the book was the profile of the author. Born in 1931 to Malayali parents in Mumbai, Suneethi Bakshi became a Kashmiri by marriage to a Kashmiri Pandit in 1957. She moved out of Kashmir in the 90s. The Kashmir history bit, especially the period of later Kashmiris Kings, Mughals, Afghans, Sikhs, Dogras and the British is really well handled, concise and useful. However, it is the 'Pandit Women's Struggle for Identity' bit that really stands out. In her own words the seeds of the book go back to 1965 when she wrote a paper titled 'The Rites of Passage of Your Community' for her Sociology course at the Maharaja Sayaji Rao University of Baroda. 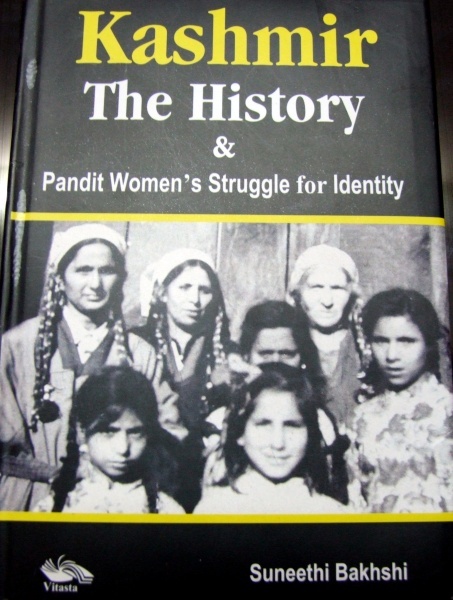 That rite part can certainly be seen in the sections about the traditions followed by Kashmiri Pandit women and in history tracts about the famous Kashmiri women of past. But the best part of the book is when she writes about the achievements of the early pioneering women who decided to get an education and then went on to excel in their fields. Equally enlightening is the part in which she writes about the efforts that were put in by some exceptional Kashmiri Pandit women in running various services for their migrant community. Towards the end it gives details of with various educational programs that these women are running. Her observations on post-migration have an insight of an insider and an outsider, like she noticed how Kashmiri almanacs now run messages about turning vegetarian and subtly claiming the Non-Veg was to blame for most of the wrongs that the community suffered. The book doesn't go into what the life of Kashmiri Pandit women was like in the past or what it was like in the 90s or even now. You won't read about stuff like how these days ashrams of Kashmiri Pandit Saints in Jammu (yes, the old ashram culture in now thriving in Jammu) have colorful charts posted on walls advising women and girls visiting the ashrams to not come in Jeans or something like that. It doesn't detail the subject of how sometimes (maybe often in their history) the fear of losing their culture and identity makes the life of a common woman difficult. How the weight of culture and identity is put on their shoulders. The book is more about the ability of Kashmiri Pandit woman to come through in tough times, its almost a celebration of their lives. Editing of the book, as often is the case with Kashmir books, could have been better, but certainly worth a read. A book written on this subject is by late Pt.Prem Nath Bazaz,tittled"Daughters of Vitasta"
Bazaz now almost a forgotten man was one of the pioneers of K.P womens' sociocultural renaissance and the one who with the help of reformers like Kashyap Bandhu and late Aftab Kaul Nizamat made the education of women a reality.I have written a whole chapter on Kp society since 1920 in my forth coming book"Kashmiryat at cross roads;search for a destiny." The poineering work done in this field by social reformers like KashyapBandhu,Aftb kaul nizamat is described by Late Prem nath bazaz in his book" Daughters of Vitasta".Anyone seriously interested in the subject should read the above mentioned book. The fanatical intolerant Conservative Pundit leadership of 1920's tried to put all sorts of hurdles to thwart the reformers.I have dedicated almost a whole chapter to this bigoted outlook of Kps in my forth coming book"Kashmiryat at cross roads;search for a destiny"
I have read Pt.Prem Nath Bazaz's "Daughters of Vitasta" in parts and i have written about Kashyap Bandhu on this blog somewhere. Thanks for sharing your thoughts and best of luck with the book!